Do you love scones as much as I do — their crumbly exterior, tender middle, and high fat profile? Traditional scones seem to audaciously flaunt the deliciousness of white flour and lots of fat! Blueberry scones in particular take me back to my teenage years when I could first drive. I'd meet my girlfriends at a locally-owned coffee shop in San Diego. I always ordered the same thing: a BIG blueberry scone (drizzled with copious amounts of honey) and Mexican hot chocolate. GOOD memories of simple times! Yet I'm glad I'm all grown up now… and can make these healthier scones for my family! This version is gluten-free, although it's so yummy you may not notice. Just as importantly, this recipe is soaked. Soaked baked goods “pre-digest” the grains to ease digestion. The nice thing about soaking is that the process is easy — almost no work. Yet you end up with a treat that doesn’t sit heavy in your belly. And any nutrients in the ingredients are awakened — in other words, bioavailable to the body! I soak scone dough by combining it overnight with an acidic, probiotic medium: either full-fat kefir, full-fat yogurt, or sour cream. See below for a dairy-free option, too! I buy Namaste Foods Gluten-Free Flour Blend at Costco, or online in bulk. This flour mix combines rice flour, tapioca flour, arrowroot powder, and a few other ingredients in the right ratios to make gluten-free baking easy. Feel free to use your favorite gluten-free flour mix instead, and comment below how it worked for you. I think that any premixed GF flour combo will do well here. My recipe calls for butter and either kefir or yogurt. Yet the last time I made these scones, I used chilled coconut oil in place of butter, and a combination of very high fat coconut milk or canned coconut cream plus raw apple cider vinegar instead of kefir. The ACV lends the acidity otherwise provided by cultured dairy. This variation worked great! See recipe below for instructions. With farm fresh eggs that have never been refrigerated and can be safely kept at room temperature, I like to leave the dough out on the counter at room temperature to ferment overnight. The warmth of the room helps the grains to “wake up” in the acid medium. And the acid medium holds back the growth of any negative bacteria. One final recipe note: If you make your scones with high fat cream (sour cream or coconut cream), the dough will be crumbly — very typical of traditional scone dough, actually. Simply press the dough together. If you make your scones with kefir, yogurt, or coconut milk, your dough will be stickier. Both approaches turn out great scones. I give some directions in the recipe below, accordingly. Cheers, and I hope you enjoy these lovely scones, that taste like white flour but are healthy and easy to digest! 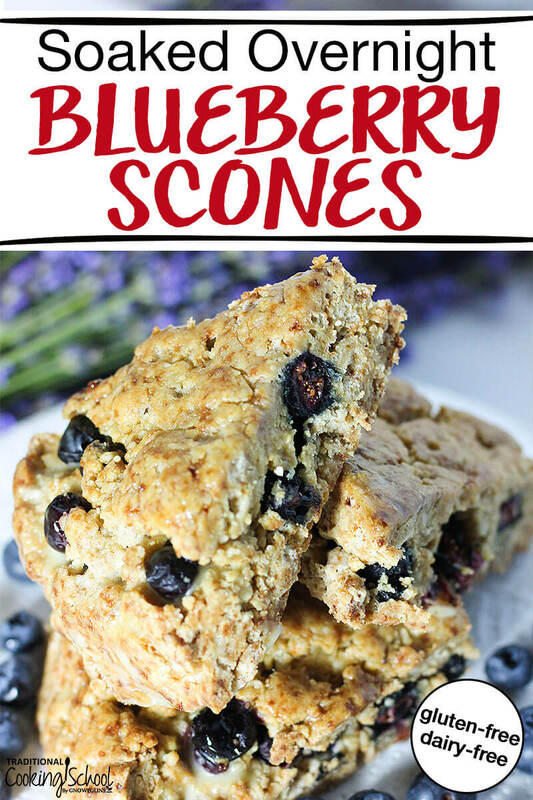 These are the best soaked overnight blueberry scones you'll ever have (with a dairy-free option)! They're easy, healthy, and moist -- just like your favorite traditional scone. 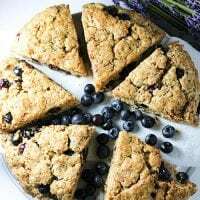 Mix together the gluten-free dough the night before, and in the morning enjoy breakfast or brunch right out of the oven -- glazed with cocoa butter and garnished with lavender flowers for a beautiful, delicious twist! Combine dry ingredients in large metal bowl or food processor: flour, baking soda, xanthan gum, coconut sugar, and sea salt. Add butter or coconut oil. Cut fat into flour mixture using pastry blender flour cutter or food processor (pulse several times) until largest butter pieces are just smaller than pea size. In small bowl, stir together wet ingredients (not including blueberries): kefir (or coconut milk and apple cider vinegar) and eggs. Place dough in a medium size ceramic bowl. Cover and leave out overnight. Or, leave dough at room temperature for 4 hours, then refrigerate overnight. 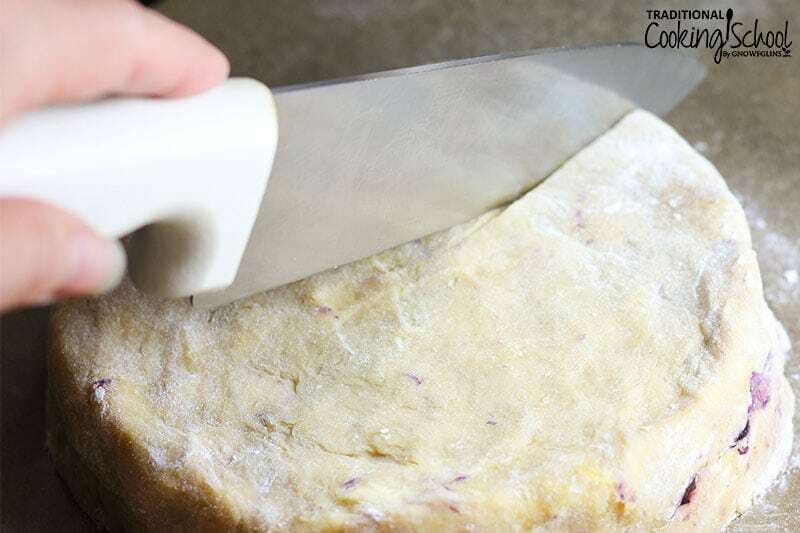 Use a spoon to scoop half of the dough into the center of the parchment paper. Shape it into a rough 7 to 8-inch circle, letting it remain a bit messy to start. Remember, we don't want to overwork the dough! Or, if your dough is made up of moist separate pieces (from the thicker, higher fat sour cream or coconut cream), dump out half of them onto your parchment and press them together lightly into an 8-inch circle. Top the dough with blueberries. Add the final half of the dough on top of the blueberries (see photo below). If dough is sticky, flour hands with gluten-free flour mix. Shape the dough into a disk, pressing dough down gently and making the sides and edges even and neat. Using a sharp pastry blade or knife (dusted if necessary), cut straight down, creating 6 pie shaped pieces (see photo below). Flour a spatula if dough is sticky. Separate the scones from one another by using the spatula to pull each one back, creating a distance of 1 to 2 inches between each one. Bake 25 minutes in preheated oven. If glaze is desired, simply melt 1/4 cup cocoa butter gently in small dry saucepan or skillet. Add about 4 drops liquid stevia, to taste, to the cocoa butter. When scones are done baking, allow them to cool completely. Then place scones in freezer for 10 minutes. Dip each one in melted cocoa butter or spoon the melted cocoa butter over each one. Top with sprinkles of dried or fresh lavender, to garnish, if desired. Allow to come back to room temperature. Do you have a favorite scone memory? 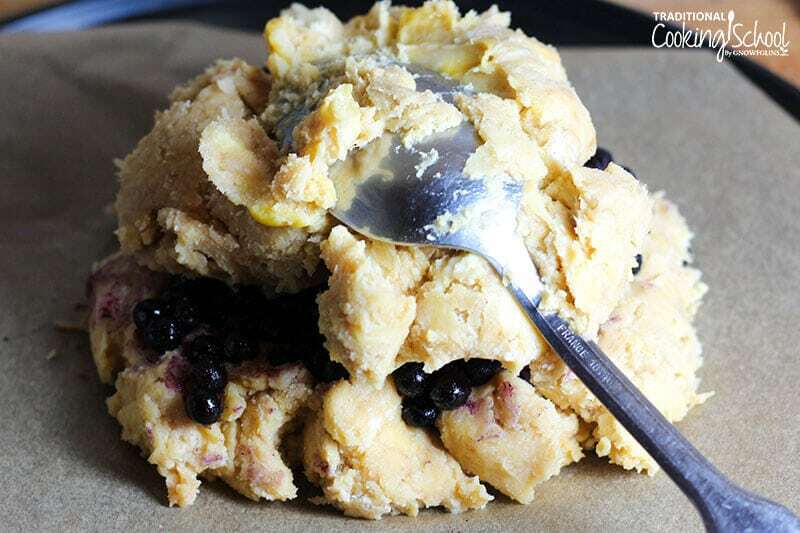 Will you try these soaked overnight blueberry scones? Cant we just soak the flour overnight and add the rest in the am before baking? Hi Helene, not with scones. They are more finicky, in order to create the right crumb. You can create a good muffin with that approach because it is a wetter dough/batter. But with this recipe the ingredients need to be mixed the way they are, partially because there isn’t enough liquid to wet all the flour without all the ingredients being incorporated, and partially because the fat needs to be cut into the flour. Hi Reba, I’m sorry. I haven’t made this recipe without eggs. Usually scone recipes are rather finicky, so it would be hard to create the same effect without eggs in this case. Best wishes! Hi Tony, I don’t personally know. Let us know if you find out more. Thank you! Also, since the Amazon owner is an extreme globalist, I prefer not to purchase any good from there. (I know, hard to believe that one can live without Amazon!) Is there another source for your book? Hi Toni, yes, thanks for asking. If you’re referring to my cookbook, you can get the eCookbook here: https://eatbeautiful.net/my-cookbook/ There is no other source, I’m sorry, for the softcover. Why do you heat the oven the night before? Is that a mistake in your recipe, perhaps? Preheat the oven the night before!? Hi Cyndi, you do this so the glaze sets. The glaze responds to the chilled dough and becomes solid.